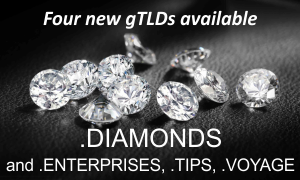 Four new generic TLDs: .Enterprises, .Tips, .Voyage and .Diamonds are now available for registration to the general public. In the first seven days of the General Availability phase, registrations within the Early Access Program (EAP) are allowed. Four additional new gTLDs are to soon to follow and be available for general registration. These are: .Shows, .Careers, .Photos and .Recipes. If you consider applying for a domain name under the above extensions, please fill in the pre-registration form or contact our Support Team for more information at support@web-solutions.eu or via phone on +44 (0) 208 133 3994.